Sometimes I wonder if Bob Hochmuth is secretly on the Farm Bureau payroll. He is relentless in asking me for resources he can put to use for growers. He throws one of the biggest Farm Bureau bashes of the year with Suwannee CARES. He’s at seemingly every Suwannee County Farm Bureau function. Now I have evidence that Hochmuth is on the take. He’s getting $500 from the Farm Bureau. I plan to confront him when he gets handed the check in plain sight at this month’s Florida Farm Bureau Annual Meeting at Ponte Vedra Beach. And I’ll give him congratulations of my own. The $500 is nice, but – and anyone who knows Bob will know I’m not speaking out of turn here – the public recognition from the Florida Farm Bureau is worth much more to him than the cash. 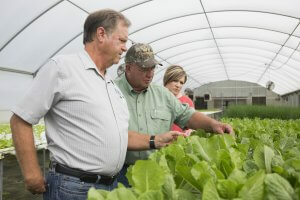 The Farm Bureau will be honoring Bob as its first ever Extension Professional of the Year. Florida Farm Bureau came up with the idea for the award after considering what President John Hoblick and UF/IFAS Extension Dean Nick Place heard at last year’s listening sessions. They heard a lot, but what inspired the creation of the award were the testimonials from farmers about the great relationships they had with their local agents. The Farm Bureau plans to put a spotlight on one of those relationships every year. The award, coordinated by Kevin Morgan, assistant to the president, gives county Farm Bureau chapters a way to recognize people who contribute to the success of production agriculture and who form strong partnerships with their local Farm Bureau. Part of what makes Bob’s award extra meaningful is that there are many who are worthy of it. The other nominees are an All-Star Extension lineup: Karen Stauderman (Volusia), Vanessa Campoverde (Miami-Dade), Celeste White (Orange), Jennifer Bearden (Okaloosa), James Fletcher (Osceola), Bradley Burbaugh (Clay), Nicole Walker (Polk), Laurie Hurner (Highlands), Libbie Johnson (Escambia), Jonael Bosques (Hardee), Jena Gilmore (Walton), and Gene McAvoy (Hendry/Glades). Suwannee County Farm Bureau President Randall Dasher, and his daughter Sarah Carte, made a great case for Bob. They cited his work bringing technology to the Suwannee Valley Agricultural Extension Center to give farmers a better understanding of irrigation and nutrition efficiency. “Bob and Florida Farm Bureau’s mission aligns perfectly as they both lead to providing opportunities for financial success as well as improving the environment for rural communities,” they wrote in their nomination. Just as important, they highlighted Bob’s personal qualities. Great listener. Comfortable talking to farmer and R&D expert alike. Always follows up. Works hard for the success of youth ag days, Farm-City Week and annual meetings. The Suwannee County Farm Bureau gets $500 for nominating the award winner. Bob’s been at this for a long time. He can drop names of Farm Bureau legends like George Poucher and Dan Buchanan. This is a bit like a lifetime achievement award that recognizes decades of service. It’s meaningful, he says, because it comes from the people he serves. When someone tells me an Extension agent is doing a good job, that’s music to my ears. When it’s Randall Dasher, Sarah Carte and Kevin Morgan telling me, it’s a symphony. I’m looking forward to hearing more of it in the years to come.